Will Faudree and Caeleste. Photo by Jenni Autry. Will Faudree and Liz Halliday-Sharp both set out of the start box in the Carolina International CCI3*-S in equal third place on 28.9 following show jumping, so whomever finished closer to the optimum time would break the tie. Liz went out right before Will aboard Pru Dawes’ Flash Cooley, a 7-year-old Irish Sport Horse (CSF MR Kroon X Castlefield Ruby) making his CCI3*-S debut, and came home 5 seconds inside the optimum time. As Will was approaching the end of the course with Caeleste, he heard Liz’s time announced and was able to ease up just enough to finish 1 second closer to the optimum time. When overnight leaders Holly Payne Caravella and second-placed Colleen Loach both picked up time penalties as the final two on course, Will and Caeleste took the win, with Liz and Flash Cooley finishing second. 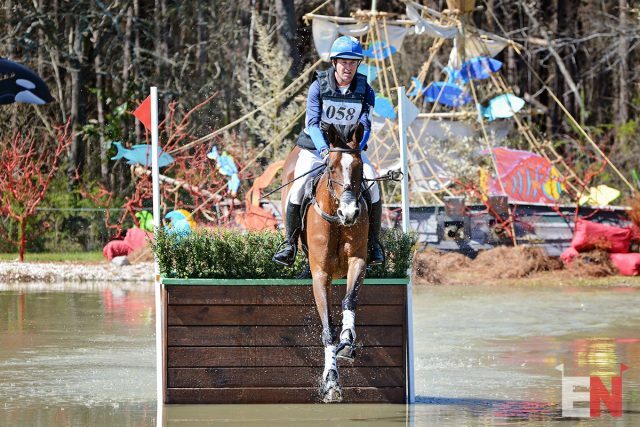 This is the second time “Mouse,” a 9-year-old Holsteiner mare (Contender X Happygolucky, by Lucky Lionell) owned by Jennifer Mosing and Sterling Silver Stables, has won the CCI3*-S at Carolina, as she also topped the leaderboard in 2016. The following year she bowed both of her front tendons. Liz Halliday-Sharp and Flash Cooley. Photo by Jenni Autry. Alyssa Phillips and her own Oskar, a 10-year-old Holsteiner (Coriando X Nicole, by Marlo), had the save of the day at the big brush corner coming out of the Cloud 11 Montrose Pool water complex and ultimately beat the clock to move up to fourth on 29.1. Dressage leaders Kristen Bond and I’m Sew Ready, a 15-year-old KWPN (Lupicor X Jarda, Elcaro) owned by John and Kristine Norton, delivered the second fastest trip of the division to round out the top five on 29.6. 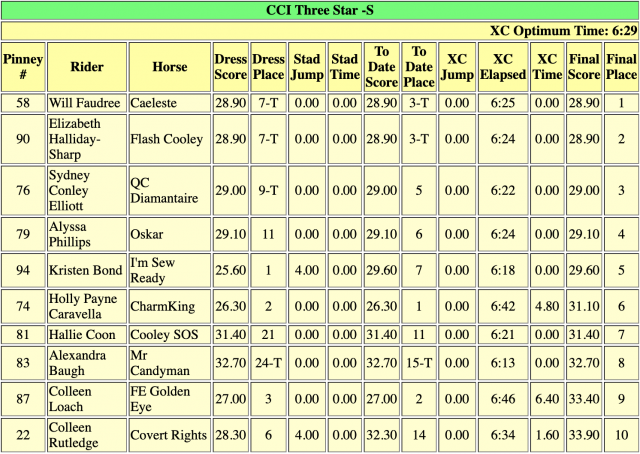 Just 10 of 54 combinations (18.5% of the field) in the CCI3*-S jumped clear rounds inside the time on Ian Stark’s track. Click here for final results. 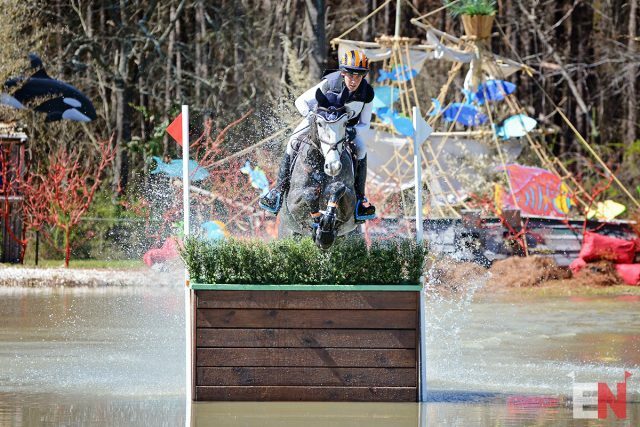 Like Will Faudree, Andrew McConnon also hails from the Southern Pines area, and taking the first international win of his career aboard his own Bossinova in the CCI2*-S in front of a hometown crowd made the result that much more special. EN readers will be familiar with “Hugo,” a 9-year-old Hanoverian gelding (Bonifatius x Dawina, by Der Lord), we featured on EN’s Got Talent last year. He added one rail to his dressage score to win on 24.3. “He was a 7-year-old when I got him. I looked for a quite awhile during my time in England, and I got him in the last 24 hours I was there. He’s excellent in the dressage and really steady. I can trust him to go in, but this year he feels stronger and is taking me down centerline instead of me pushing him, which I think is where those extra marks came from,” Andrew said. Kyle Carter and Gaillards Lancer, an 8-year-old KWPN gelding (Diarado X Urlanta, by Flemmingh) owned by Brandon and Savannah Blackstock, jumped clear to finish second on 27.5. Hugh Wrigley and his own FE Santos, an 8-year-old Hanoverian gelding, jumped clear to round out the top three on 28.9. 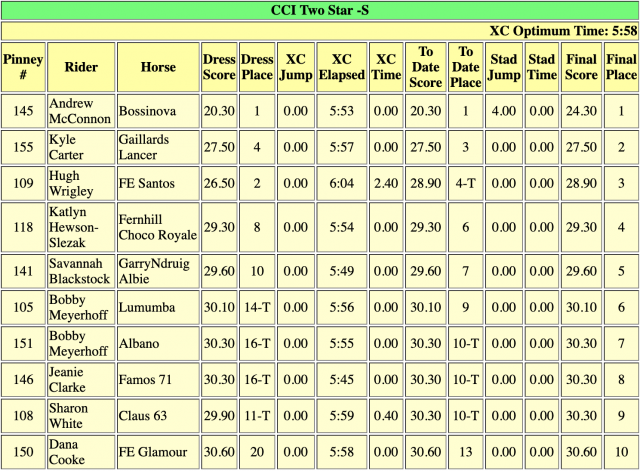 Click here for final scores in the CCI2*-S.
Will Faudree praised Organizing Committee co-chairs Jane Murray and Bobby Costello for their dedication to running a top notch event, particularly in regards to improving the footing on cross country and widening the galloping lanes. 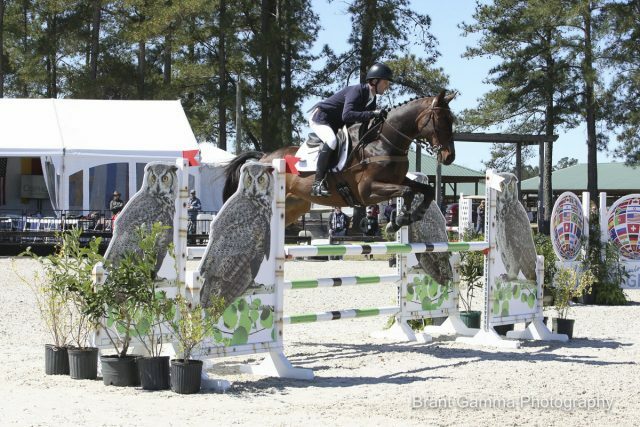 “It was really an effort from the Carolina Horse Park and the Organizing Committee of the Carolina International that pushed for things that aren’t always so important for spectators, but with the ground and the footing they just did an unbelievable job,” Will said. The action at Carolina International concludes Sunday with cross country and show jumping in the National divisions. Click here to catch up on all of EN’s Carolina coverage. Go Eventing.